This is the concluding blog on my question of which company’s device I should adopt: Apple or Samsung? I am a longtime iPhone user, and wouldn’t have considered switching if it weren’t for the fact that the new iPhone does not have a headphone jack. That set me to researching other options, which I described in my first blog. In my second blog I explained why I selected the iPhone 8 Plus. I had looked at the iPhone X, but hesitated since it would have cost almost $300 more. It turned out there was a special offer on the iPhone X that left it costing “only” $60 more. So after some consideration, which included using both the iPhone 8 Plus and X at the Apple store, I decided to go with the iPhone X, not only because of its smaller size and larger screen, but also my interest in face recognition as a security feature. 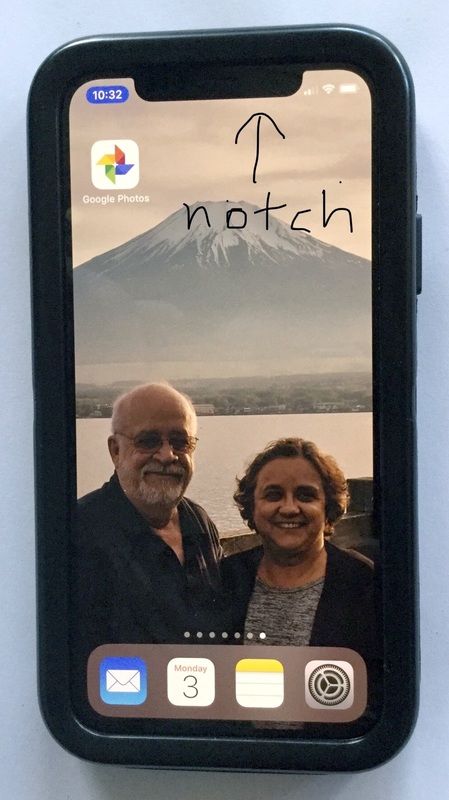 So now I am the proud owner of an iPhone X, and starting to learn how to use an iPhone without a Home button and with Face ID recognition. I must admit I was curious about how the facial recognition would work. Would it recognize me with sunglasses on? What about poor lighting? The answer turned out to be yes and yes – it recognized me both times. In fact, its facial recognition feature seems to be more consistent than the fingerprint recognition feature on my previous iPhone. Transferring my data and applications from the iPhone 6 Plus to the iPhone X was easy but time-consuming. It took almost two hours despite my high-speed Wi-Fi. 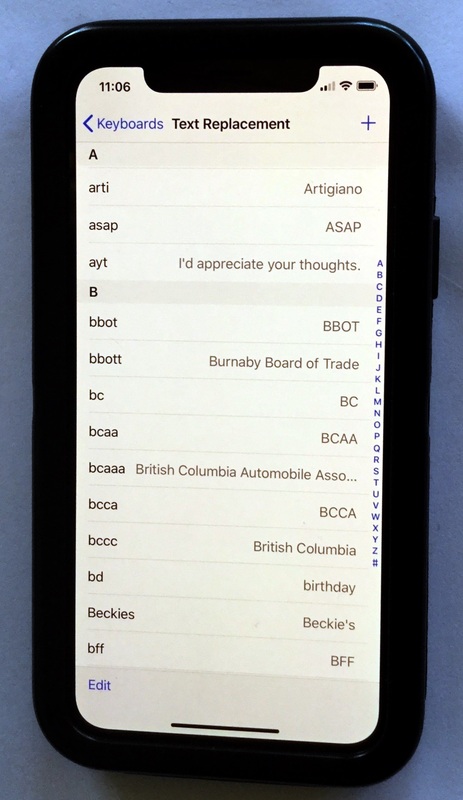 Everything transferred well, fortunately, even the more than 50 text-replacement shortcuts that I had set up (below). I also had no problems with the usual Bluetooth connections – both my Garmin watch and my car reconnected as if nothing had changed. One thing I did realize after using the iPhone X for a couple of days is that an iPhone X user needs both finger and hand flexibility to accomodate both swipes and multiple button pushing. I can’t pretend I didn’t miss the Home button, which has been replaced by swiping, and remembering which swipe does what takes some getting used to. Swiping up from the bottom of the screen gets to the home screen, swiping down from the upper-left corner reaches the control screen, a half0swipe from the bottom gets to the apps switcher, and so on. The process for capturing screenshots has changed as well. On the iPhone X, two buttons have to be pressed simultaneously – the volume up button on the left side and the side button on the right. I can get used to these changes, but I wonder how someone with serious joint pains like arthritis would cope. The lack of a headphone jack remains frustrating as well. When I receive a call on my iPhone X, I have to look for not only my earphones, but the special connector – i.e. 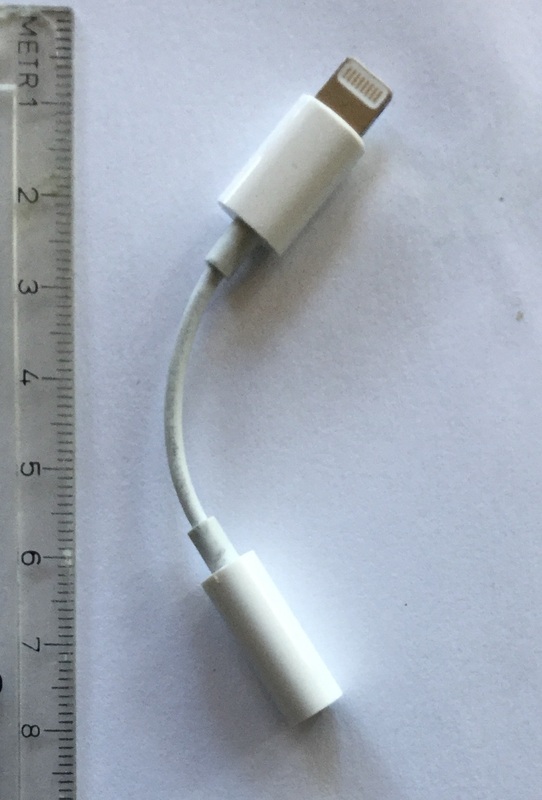 the dongle – that came with my X as well (below). Using a Bluetooth earpiece – Apple’s much-vaunted “Airpods” would not have been any faster, as I would have to power them on and then wait until their Bluetooth connection was working. Not to mention the two extra dongles I purchased added a little over $20 (tax included) to the cost of my phone. Something that unexpectedly annoys me is the black notch along the top of the screen (below). It seems to interfere with the display and simply does not fit into the modern design of the iPhone X. Another minor issue is that my battery use percentage does not show on the main screen like it did on the iPhone 6 Plus. Instead, it must be accessed with yet another swipe motion, this time from the top right corner down. The time, meanwhile, is shown on the top left corner. The bubble behind the time turns green while the phone is in use and blue when an app actively uses the location tracker – in this case Google Maps (see below). I must admit that even with the high price, the black notch, and the missing headphone jack, I am impressed by the iPhone X. It is intuitive, easy to use, and as of day six, I have not required another visit to the Apple store for additional support. Do you have an iPhone X? Do your experiences match mine, or are they different? Let me know by posting a comment below.